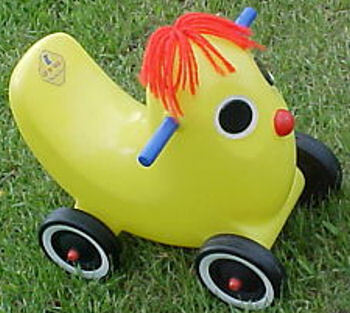 We have a mailing list of people looking for either the riding or rocking version of this toy. We received a warning from a family member of the engineer who helped to develop this toy, telling us that it was discontinued, because it was unsafe. They advised not to get one for a child. I’m looking for Little Tikes Ollie with Wheels, a vintage riding toy from early 80’s. It is yellow banana shaped with big eyes and red yarn hair with wheels. My sister had one when she was small, and our mom gave it away. I would love to be able to give her another one of this toy that was so special to her. There was also a riding version missing everything but the wheels and body…. Thanks, Miranda! There’s a complete riding one on eBay right now, too, so I sent them that as well.